Sure, I know beer is a more typical pairing choice for chili. Some folks even swear by milk! 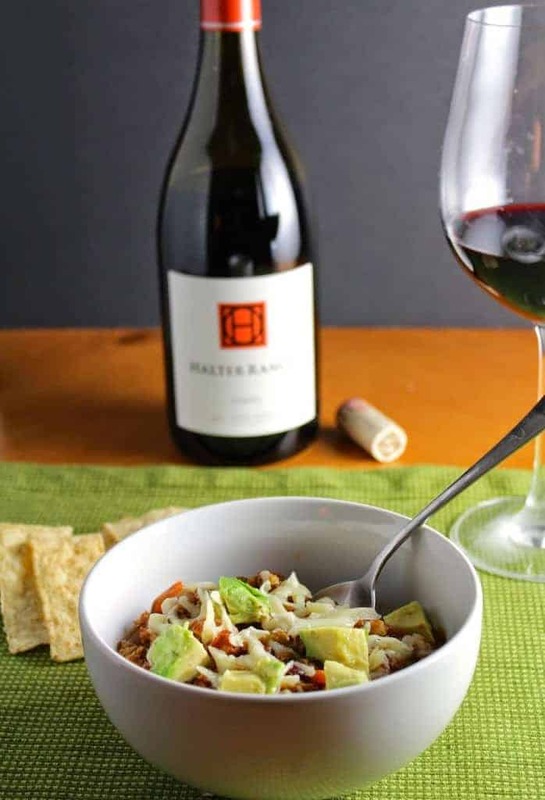 But wine is definitely my beverage of choice to enjoy with a meal, so I’ve been working on getting chili and wine pairing down to a science–in this case, turkey chili and wine pairing. During my latest chili and wine pairing adventure, I started with the wine I wanted to serve. I had another bottle of the 2012 Halter Ranch Syrah from Paso Robles waiting in the wings. It paired nicely with this grilled tuna, which was served with a mix of grilled eggplant and spicy peppers. I had a notion that it could also do very nicely with a chili. 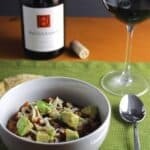 One key that I’ve found to chili and wine pairing is to make a chili that is flavorful but not overwhelmingly hot. You start making 5 alarm style chili, then you are going to need to defer to beer. I made this chili with some healthy ground turkey, and a nice blend of spices to give it plenty of flavor without overwhelming heat. Though I prefer wine with the chili, I did use some beer in recipe. And yes, a little bit of chocolate goes in to deepen the flavor. Ingredients and full recipe details are down in the EasyRecipe card toward the end of the post. This is a pretty simple recipe. Get the veggies sautéing in a large pot, then brown the ground turkey. After the turkey has browned, add the tomatoes, tomato paste, and beans. Bring to a boil, then reduce to a simmer. Add the dried spices, cover and simmer for at least an hour. After an hour, add the lime and beer simmer, and simmer for 1 more hour. Serve the chili in bowls with the toppings. Avocado is a very nice touch here! I found we needed less cheese and sour cream with the healthy fruit in the mix. Enjoy! Wine Pairing: The Halter Ranch Syrah has a big fragrance of violets and forest floor. I got blackberry jam and white pepper taste. The Syrah opens nicely and shows a lot of finesse on the long finish. 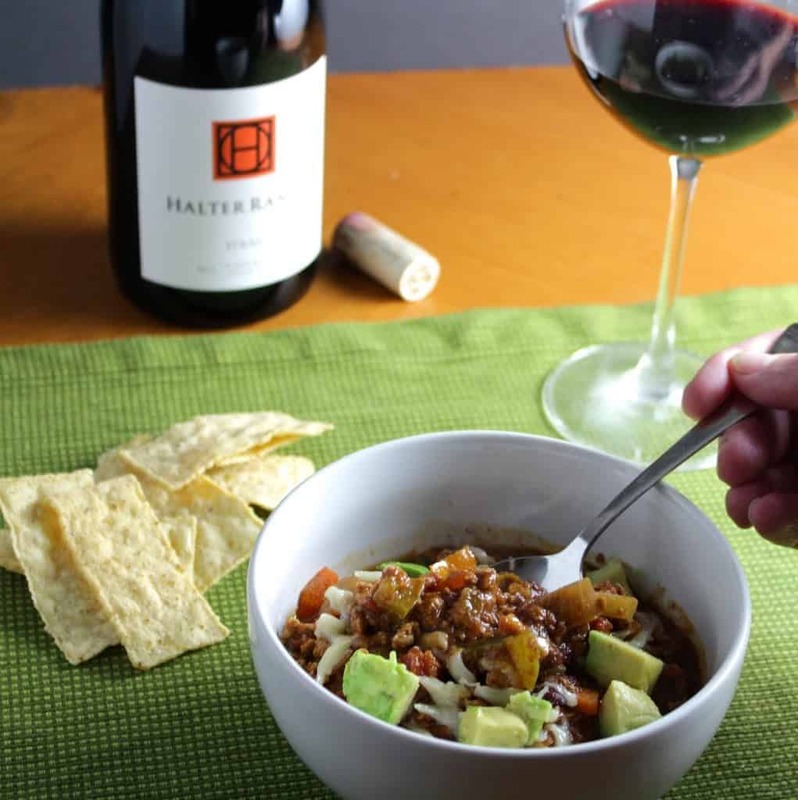 There’s a depth and complexity to the wine that works nicely with the lively flavors of the chili. 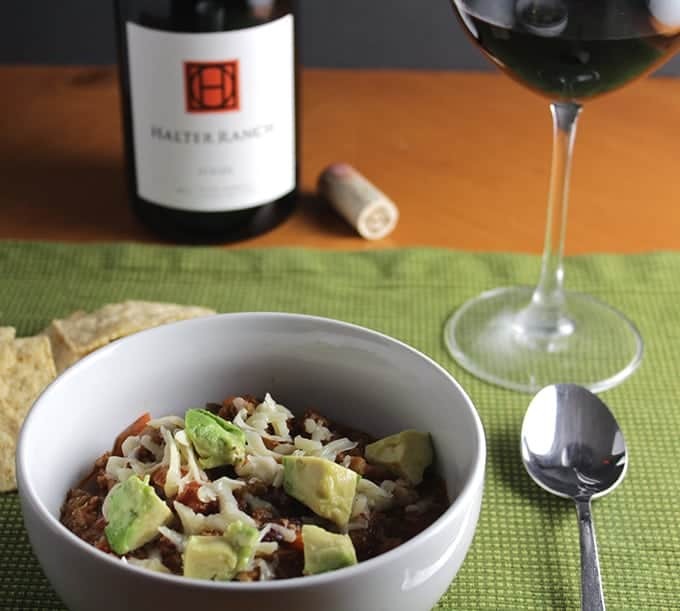 This wine definitely qualifies as a good pairing for a flavorful, mild to medium chili. Give it a try! 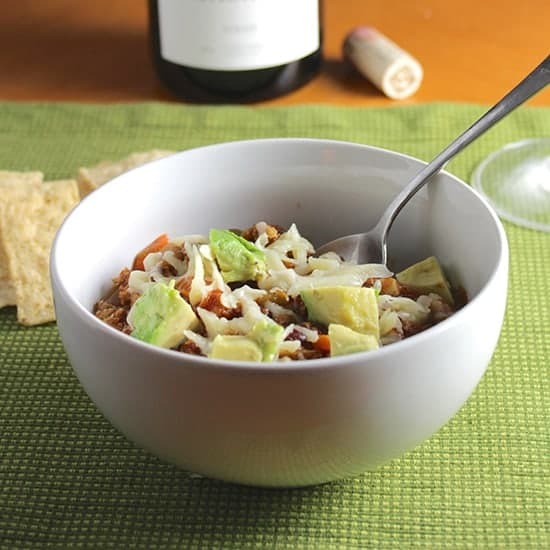 Flavorful Turkey Chili with Avocado topping for extra flavor and nutrition. Heat the olive oil in a large pot. Add the vegetables through carrot as they are chopped. Next, add the ground turkey and brown, about 10 minutes. After the turkey has browned, add the tomatoes, garlic, tomato paste, and beans. Bring to a boil, then reduce to a simmer. Add the dried spices, cover and simmer for at least an hour. Full disclosure: I received a complimentary sample of the wine from the winery. As always, the opinions and recipe are entirely my own. I love Syrah and chili. It’s a perfect pairing in my book! Definitely in the mood for chili right now, this looks so hearty and delicious!